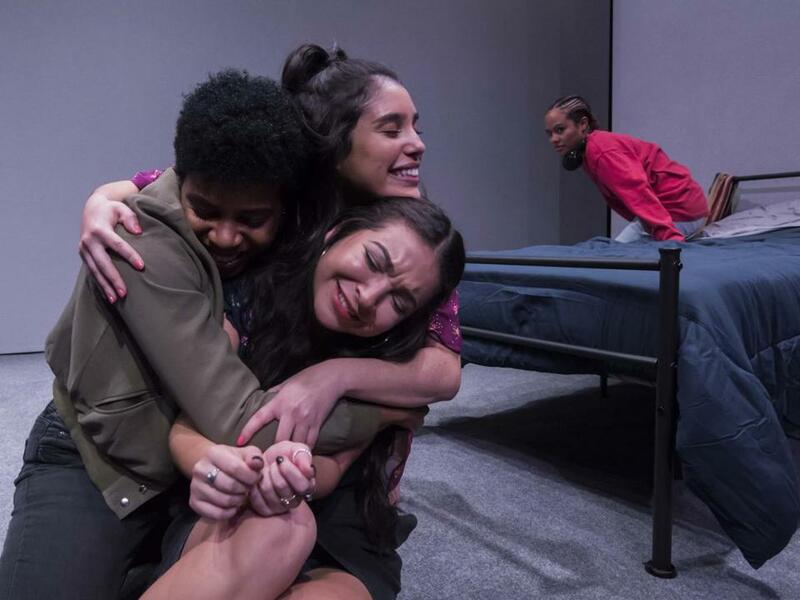 Rockwell’s jolting and urgent new work, which features a diverse and passionately committed young cast at Boston Playwrights’ Theatre, focuses on four teenage girls in a Texas residential treatment facility who are coping — or not — with the suicide of one of their housemates. A delegation of “suits’’ from the state are slated to arrive soon to probe her death, igniting concern among the remaining girls that the facility will be shut down and they will be sent to foster care. “So basically [expletive] is about to go down and we all need to secure our next placement,’’ says 16-year-old Charlie, the anchor of the group, portrayed by Tatiana Chavez in a performance that astutely balances Charlie’s compassion, pragmatism, and the strength that lies beneath her fretfulness. The threat of dislocation is the latest blow for young people who have already had more than their share, and whose hands are full trying to work out the complexities of their own lives, very much including the troubled families from which some of them come. “The Tragic Ecstasy of Girlhood’’ falls into a couple of predictable grooves and would benefit from more development before the play moves on to a West Coast premiere scheduled for December. But at its not-infrequent best Rockwell’s drama, which is tautly directed by Leila Ghaemi, carries the ring of real-life authenticity. It’s as if we’re immersed in the dilemmas of kids who are wrestling with the kind of fears — of abandonment by the people they love, of being simply lost in the bureaucratic shuffle — no kid should have to face but too many do. Rockwell is smart about such often-unspoken fears and about the dynamics of interplay among teenagers, that blend of camaraderie and competitiveness, how friends can be affectionate with one another one moment and snappish the next as their identities take shape, step by wobbly step. Crucially, the playwright, director Ghaemi, and her cast also capture the volatile, charged-up atmosphere that surrounds this particular group of girls. Facing challenges well beyond the quotidian issues of adolescence, they are sometimes uncertain what to wish for. What a playwright wishes for is to have an impact on an audience, and in that regard Rockwell has succeeded. I can’t recall the last time I saw a theater audience react with such visceral anguish. Deep, wracking sobs could be heard during the performance I attended, and when “The Tragic Ecstasy of Girlhood’’ was over, several people were still rooted in their chairs, struggling to collect themselves. It was clear that something in the play spoke powerfully to them and their personal experience — quite possibly the experience of losing a loved one way too soon themselves. The loss that lingers and reverberates through “Tragic Ecstasy’’ is that of 16-year-old Amber (Sarah Hirsch), who is seen in flashback scenes with Charlie, confiding to her about Amber’s desperate desire to reconnect with her birth mother. The girl to whom Amber was closest, Charlie is haunted by the unanswered questions surrounding her friend’s death and seems to feel a vague sense of responsibility (and it turns out she’s not the only one battling that feeling). Then there are 15-year-old Mercy (Danielle Palmer), who projects an air of confident command that is undone when she learns her unpredictable father, who has regained custody, is coming to take her home; 16-year-old Audi (Stephanie Castillo), the worldly-beyond-her-years picture of insouciance and sophistication; and her guileless 14-year-old sister, Izzy (Amanda Figueroa), who doesn’t understand why Audi seems so eager to erase the memory of their family. It is Izzy who has the last word in “The Tragic Ecstasy of Girlhood,’’ and the play’s finale makes you catch your breath with its sense of innocence lost and its evocation of the traumas women have experienced in all times and places through history. Rockwell has said that “The Tragic Ecstasy of Girlhood’’ was inspired by her three years working in the recreational department at a similar residential facility in Texas before she moved to Boston, where she is currently pursuing an MFA in playwriting at BU. She is having one heck of a year. Her “With My Eyes Shut’’ won a couple of awards at the Hollywood Fringe Festival this past summer, and her “Nomad Americana’’ was produced by Boston’s Fresh Ink Theatre in February. As part of BU’s New Play Initiative, “The Tragic Ecstasy of Girlhood’’ is kicking off a season of coproductions by BPT with the BU School of Theatre that will feature plays penned by writers who are, like Rockwell, students in BU’s MFA playwriting program. I’d say those other plays have a tough act to follow.